The competition is open to all professional photographers and young talents, without any restriction in terms of nationality , who wish to present a selection of photographs (between 15 and 25) of a finished work that has been carried out in the past two years and that is related to the theme, interpretable either through stories that are focused on contemporary issues of great scope or on micro-social contexts of everyday life and situations that are given little space in traditional media. 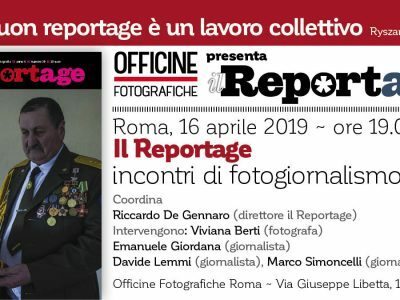 An initial selection of the works will be curated by the editors of Il Reportage and the staff of Officine Fotografiche Roma, with the publication of the 25 projects that will take part in the final stage of the competition on the Il Reportage website. The selection of the finalists and the winner will be entrusted to professionals from the worlds of journalism, photography and publishing: Elisabetta Buffa (President of Phos – Centro Fotografia Torino), Claudio Corrivetti (Founder of Postcart Publishing House) Riccardo De Gennaro (Director of Il Reportage), Emilio D’Itri (Director of Officine Forografiche Roma), Giulia Ticozzi (Photoeditor of La Repubblica), Riccardo Venturi (Photographer from Contrasto Agency). The winner and the two runners-up will be announced during the award ceremony which will be held during the FotoLeggendo event, in Rome, on 10/06/2018. 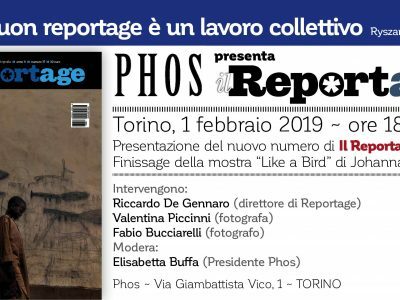 The works of the top three photographers will be published – between 2018 and 2019 – in the portfolio section of the review Il Reportage. The winner will receive a prize of 1,000 euros, the second and third prizes will each be 450 euros. – The selection for the competition is open from 20/03/2018 to 20/05/2018. – There is no restriction in terms of the nationality of participants. – It is possible to participate either as an individual photographer or as a collective. – Participants must be at least eighteen years of age. – The photographs submitted must be part of a single body of work and form a coherent narrative. – The names of the 25 finalists will be announced on the Il Reportage and Officine Fotografiche websites on 28/05/2018. – The names of the winner and the two runners-up will be announced on 10/06/2018 during the awards ceremony to be held at the FotoLeggendo event in Rome, in the presence of the jury members. – min 15 – max 25 photographs of a single finished documentary project that has been realized in the last two years. – the photographs must be saved in JPEG format and fall within the range of 1Mb – 3 Mb. – If a work is selected it is important that the photographer has the original files in high resolution for printing. – captions in metadata of each photograph must be included. – all the data must be sent in a single zip file (photographs – project – bio) to ilreportage.media@gmail.com via WeTransfer. – The zip file must be named as follows: title of the project_name_surname. By the act of sending in the abovementioned documentation the author guarantees that he/she is their sole and exclusive author, and in compliance with Italian Law N° 633 dated 22 April 1941 and subsequent amendments (governing the discipline of copyright in Italy). 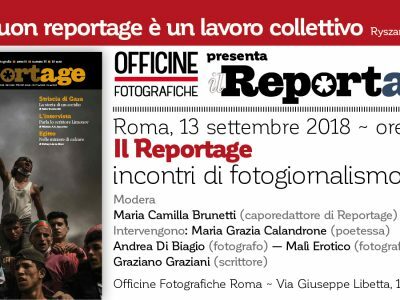 The photographs of the twenty-five selected works published on the Il Reportage website will remain the exclusive property of the author, who authorise Il Reportage and Officine Fotografiche Roma to use them on social media free of charge, excluding use for commercial purposes. I can’t submit my project through we transfer. Can I send it through my gmail? Hi, what is the procedure to send the images? Hey, there, how to submit photos? Can anyone answer please?